With the help of our dedicated team members we are able to offer our clients a wide array of Door Mortise Handles. These Door Mortise Handles are widely known for its sturdy construction, high dimensional accuracy, high tensile strength and artistic look. Demands of our Zinc Handles are increasing day by day for its optimum performance and high durability. 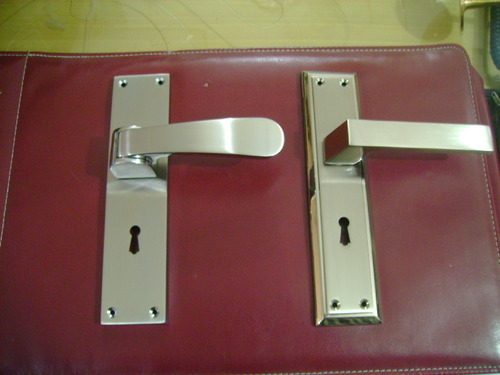 Customers can avail these Zinc Handles at most reasonable rate. Collective efforts of human and physical expertise help us in manufacturing, exporting and supplying an extensive range of Metal Door Fittings. Our products include Aluminium Door Fitting, Brass Door Fitting, Iron Lever Latch, Brass Door Knocker, Brass Lever Handles, Cabinet Knobs, Brass Numeral & Alphabet, and Brass Plate handles, Iron Lever Handles, Brass Door Knobs, Brass Pull Handles and Brass Tassel Hooks. We manufacture these products using high quality aluminium, zinc, iron and Ceramic planter. Our quality analyzers stringently examined the quality of the products before supplying them into the market. These products are widely appreciated by our customers, due to their exclusive features which include easy handling and low maintenance. Due to these features, we have been able to export our range in the following sectors such as commercial establishments, hospitality sectors and corporate offices.